Home › Knitting › Cerber-issy – take 1! 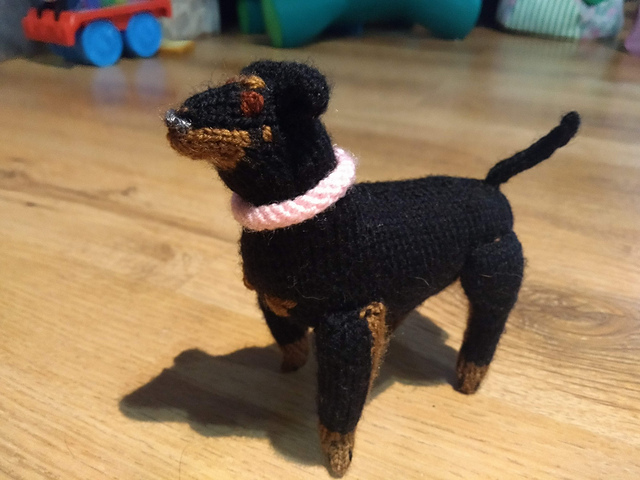 So, Felix wanted me to knit her a Cerberus to look after her haunted house, easy enough, except it had to also look like her favourite fur cousin, Missy. Despite her markings, she isn’t a Rottweiler. She is a bundle of adorableness though! Poor Missy was now in the cone of shame. What to do? 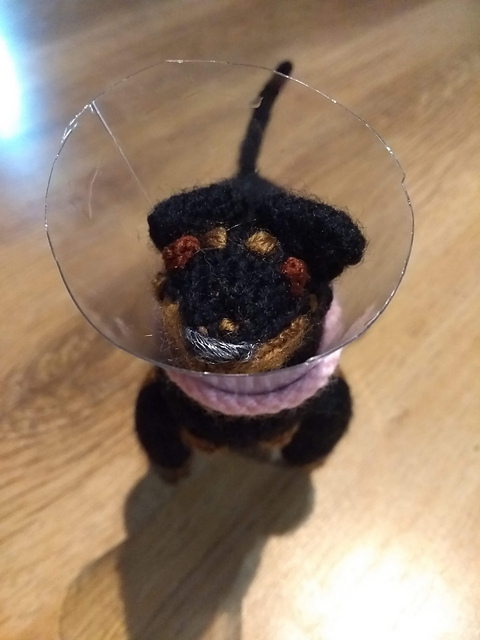 Put a cone of shame in the knitted one of course! At this point I realised this Cerber-issy was going to be way too big for the haunted house, so this little cutie will be going up to Scotland to join the real Missy whilst I continue with Cerber-issy Take 2! Missy does not like the cone of shame! She has turned out amazing, I love the attention to all the details – her little triangle chest markings, eyebrows and even rosy cheeks! I’d love to see her in her little we bed! And glad you like her!